We have tested free version of Adware Remover on clean uninfected system. The application has detected 4 registry entries related to browser hijackers and entire cookie directory (see screenshot below). All found registry entries contained default settings of Microsoft Internet Explorer, which were absolutely safe. All cookies on our test system were related to legitimate Internet resources and did not possess any threat. These facts prove that Adware Remover uses false positives. 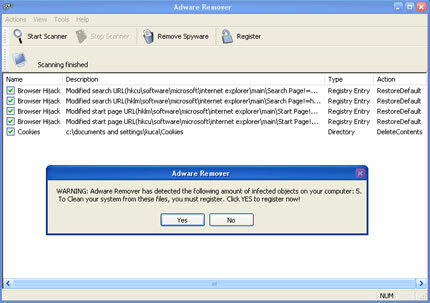 Free version of Adware Remover refuses to remove any found objects. It asks to register and purchase full commercial version. Adware Remover is the same application as AlertSpy, Doctor Adware, AdwarePatrol, SpywareRemoval and others. It has the same interface, spyware definitions database and produces exact scan results. Installed files are terribly similar. Domains associated with Adware Remover are adwareremover.ws, mandelenterprisesltd.com and platinumpartner.com. 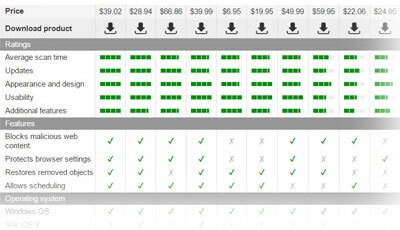 None of these sites contain detailed information about the software and its vendor. We DO NOT recommend this product! This entry was posted on 2014-05-07 at 00:40 and is filed under Corrupt Anti-Spyware, Software.